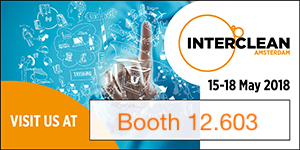 For this new edition of the Interclean show, we will be focusing on our core expertise: Aircare. You are invited to live an olfactory experience on our booth and discover how it is important to differenciate deodorisation in places such as washroom, locker room, waste bin storage... and the creation of an olfactory ambiance in your living spaces, thanks to refined designer fragrances. From revolutionary to more classical airfreshners, we will please your senses. Also, we will share our product philosophy and our perception of consistency. At Hyprom, no planned obsolescence but sustainable and greener products with a simple but elegant family look. Products in line with our core values and business: hygiene.